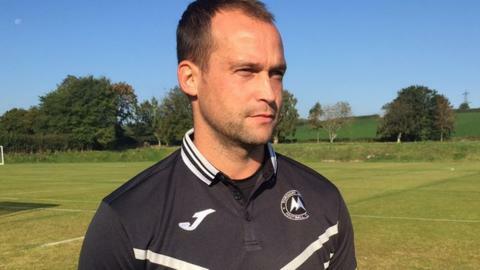 Torquay United manager Kevin Nicholson says his side are making progress, despite dropping to third-from-bottom of the National League. Torquay have not won in six matches and are five points from safety, having conceded seven goals in their last two league matches. "They've made steps forward," Nicholson insisted to BBC Radio Devon. "Anyone who's watched our games will see that they're a better side than they were six weeks ago." He added: "But they've got to take that final step. It's not a magic wand, it's not doing anything clever, it's doing the basics." Torquay are in the lowest position they have ever been in in the club's 126-year history, having won just three times all season. "It's about each individual that's out there, that he's doing his job as well as he can do it, and if you do that then the team starts to look good," added Nicholson, who succeeded Paul Cox as manager in September. "We did that in the previous four games when we were unbeaten. "It's been two games, I know there's a lot of doom and gloom, I know there's a lot of frustration, but these are young lads so when you lose it hurts. "It kills me every time you lose, as a manager, as a player, as a fan of the club, it's knife-into-the-heart kind of stuff, so if you're a young lad it's tough to get over that, it leaves a scar."